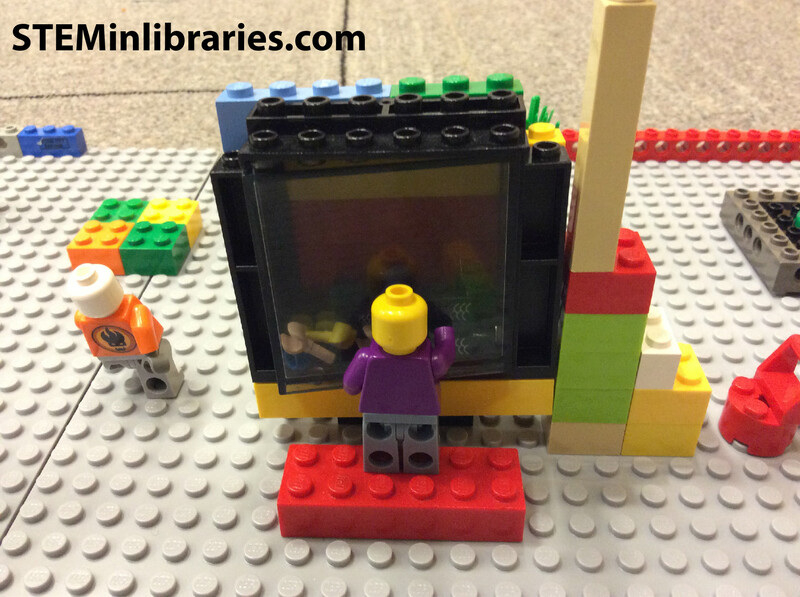 Brief Description: Using LEGO bricks, learn how to make a to-scale model of the library. 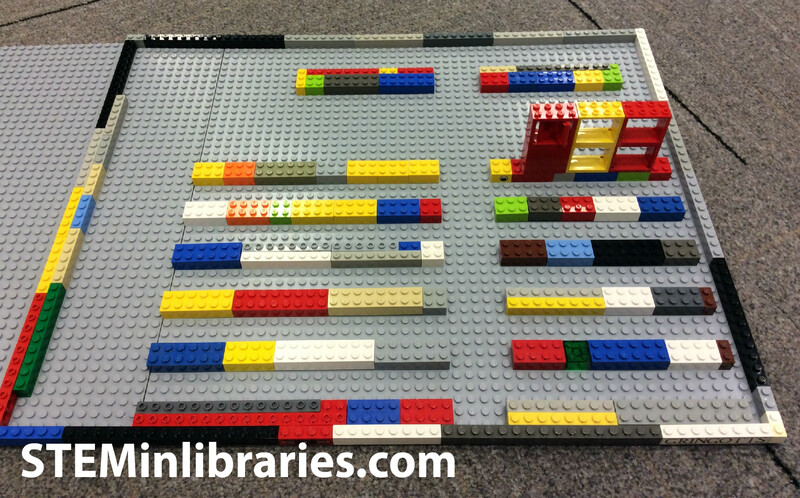 Obtain or create a basic floor plan or map of your library. The map can either be fully outlined, with furniture outlines and architectural features represented, or it can be completely blank, with only the room shapes outlined. If possible, determine the basic dimensions (length and width) of the space participants will be recreating. Use these measurements to find the best ratio for building. For simplicity’s sake, we had 2 feet equal 1 LEGO stud, for a 2:1 ratio. Introduction and description of the project. Discuss the basics of architecture and buildings. This was an open discussion, where participants discussed what they thought architects did, and how buildings were made. Explainthatstuff.com has a good explanation of the overall building process. Explain ratios. We found Studyzone.org’s Scales Lesson to be helpful in explaining ratio principles. Measure walls, aisles, bookshelves, furniture, etc., and record on map. Beginning building, based on map and measurements, LEGO model. Break participants into groups. 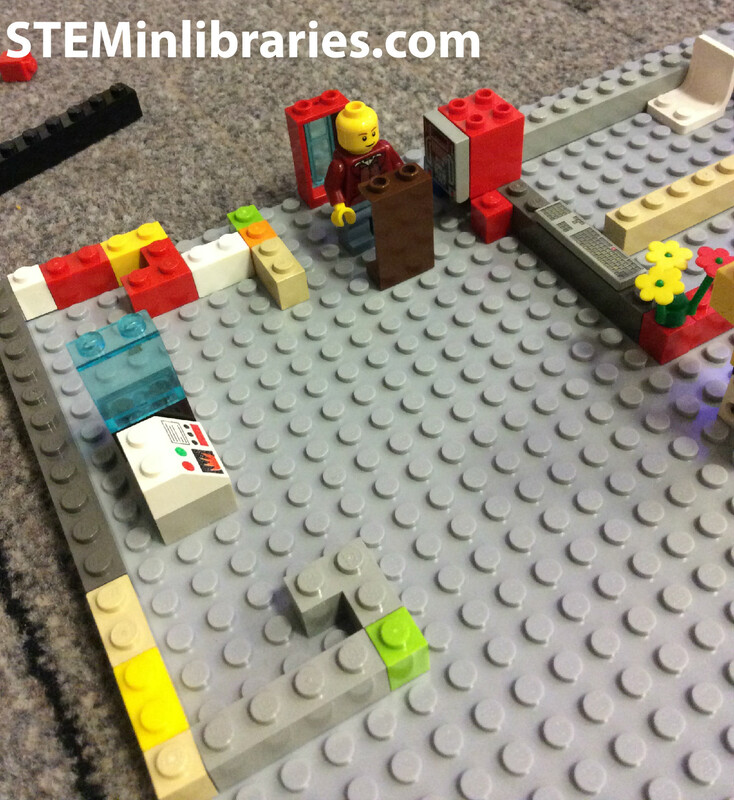 Assign each group an area of the library to measure. Have a librarian assigned to the group to accompanying them on their surveying expedition. In the last 5/10 minutes, allow groups to present their models to the other groups. Groups were assigned different sections of the library to map and survey. They were given a measuring tape, clipboard, pencils, and a copy of the blank floor plan, along with some blank sheets of paper to use for additional notation. Groups then mapped out the key features of their area (aisles, furniture, shelves), and then measured those features, noting the length and width. 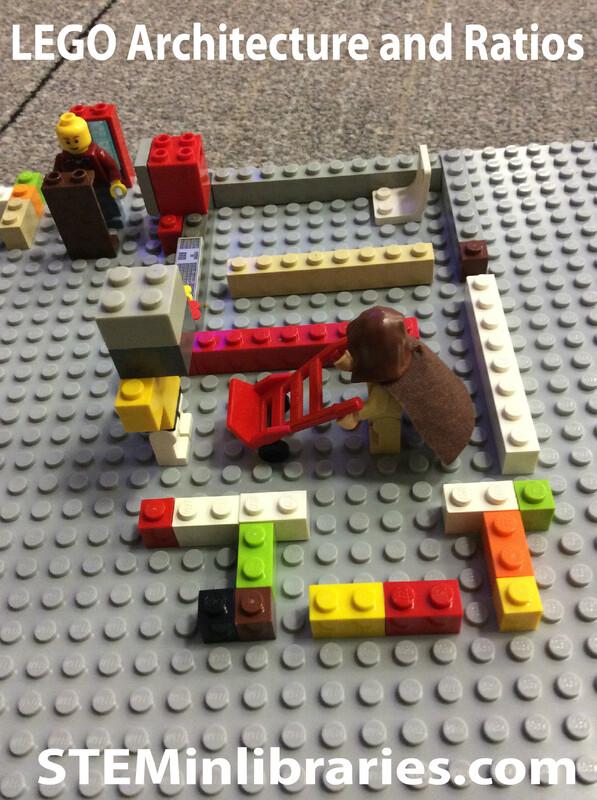 When building the LEGO models, groups used the measurements they had taken of their area and converted the figures into the appropriate ratio. So, for example, if a bookcase measured 16 feet by 4 feet, using a 2:1 ratio, the LEGO model bookcase would be 8 studs by 2 studs. The initial inspiration for this program came from a presentation called Put Down the $800 Chair and No One Gets Hurt at the 2014 Illinois Library Association Conference. 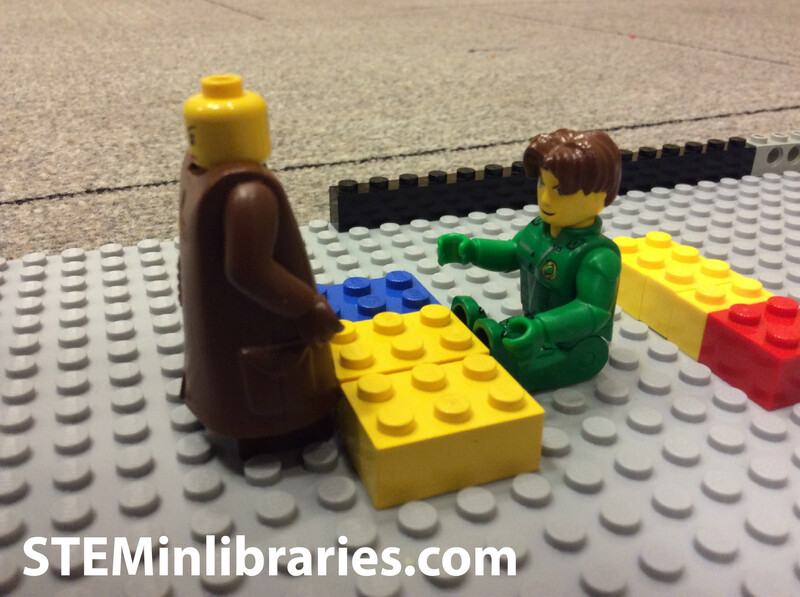 Presenters from Shorewood-Troy Public Library District had built LEGO models of their library’s floor plan to use as a visual when considering a library remodel. This program was extremely popular and well received. Our only recommendation for change would be to lengthen the time of the program to at least two hours. Participants took their roles very seriously, and took their time getting proper measurements and being sure to build things just so. This program could be adapted for a younger audience, grades 1-3, if the ratio portion of the program was removed. 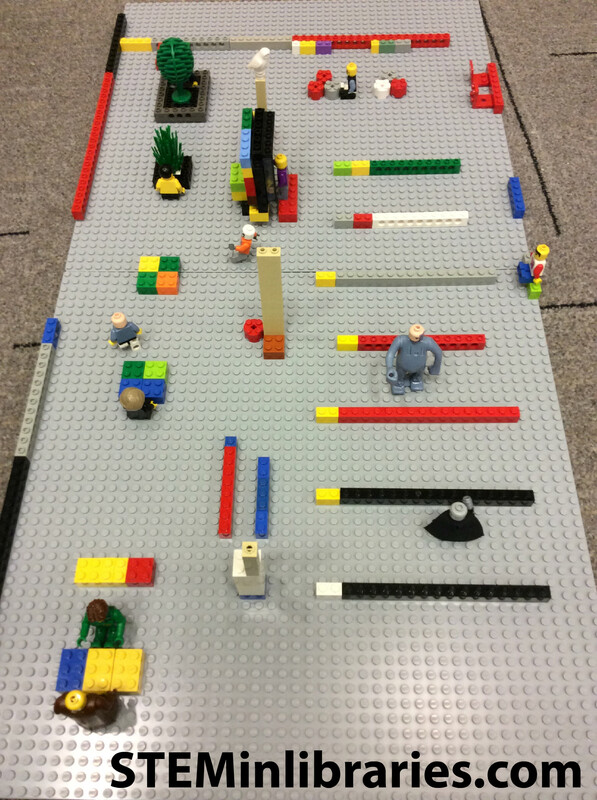 Young participants could sketch out their assigned area on the map and then recreate it with LEGO pieces, as they best see fit. The program would work well with an older, teen, audience, as planned.